And so the story repeats once again in Q1 2014. Central Bank latest data on credit advanced to Irish resident private sector enterprises attests to the lifeless, deleveraging-bound, zombified banking sector. Credit advanced to financial intermediation companies is down 3.63% in Q1 2014 compared to Q4 2014. This marks 9th consecutive quarter of declines. Since Q4 2008, credit has fallen in 11 quarters, and actually it has fallen in 12, since Q4 2011 rise was down to reclassifications being factored into the equation for the first time. Worse than that, majority of declines came since the current Government took office, not before. Credit advanced to financial intermediation and property sectors fell 4.05% q/q in Q1 2014. The fall was steeper than in Q4 2013 compared to Q3 2013 and also marks ninth consecutive quarterly decline in the series or 11th if we are to control for 2011 reclassifications. 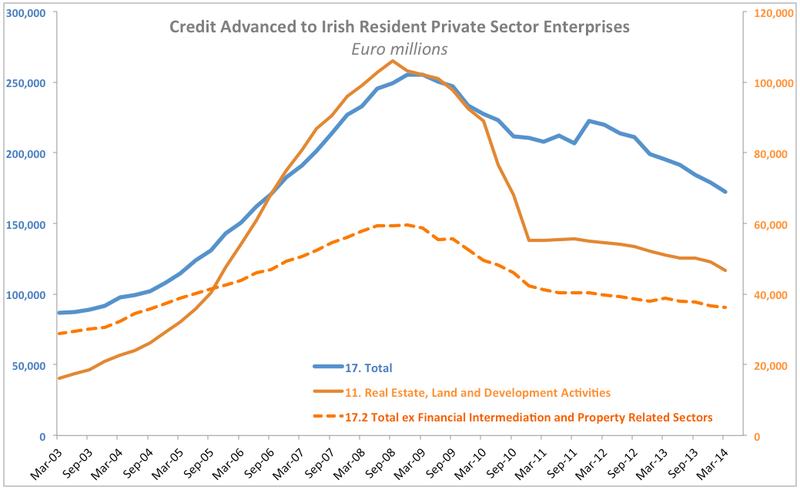 Excluding financial intermediation and property, credit advanced to Irish resident non-financial companies ex-property sector has fallen 1.31% q/q in Q1 2014. This marks fourth consecutive quarterly fall. Credit to the real economy is now down in 20 quarters since Q4 2008. Since the current Government came into office, credit to these companies is down in 10 quarters out of 12. Total credit advanced to Irish resident enterprises was down 3.49% q/q in Q1 2014 - steeper than the decline of 3.07% recorded in Q4 2013, and marking ninth consecutive quarter of declines (11th, if reclassifications are ignored).